Our film budget template is provided as a guide to help indie producers estimate their movie production costs. The movie sample budget template can be extremely helpful in determining how and where you can manipulate costs to meet a fixed film production budget. Alternatively, the budget template is a great starting point to demonstrate film negative costs required for the financial projections and business plans used to secure movie investors. Film budgeting is extraordinarily complicated, and we highly recommend you bring on an experienced Line Producer to review your financials and help with areas that may need adjusting. Please Note: This tool is limited in scope, and not meant to take the place of more advanced systems, such Movie Magic, Gorilla, etc. This download is for a sample movie budget template as a static PDF file. Our actual indie Film Budget Worksheet Template is in Excel, fully editable and contains 100s of line items and formulas that can be completely customized to your film production. 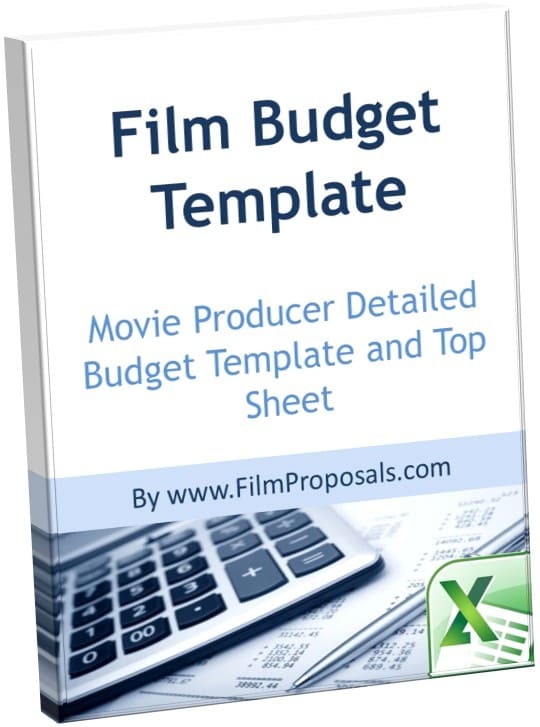 Included with Silver & Gold Film Financing Packages - The Film Budget Worksheet Template is in Excel, fully editable and contains 100s of line items and formulas that can be completely customized to your film production. One of the most under-budgeted areas for first-time film producers is rehearsal and prep costs. Let's say you know a supporting actor is required for five shooting days at the rate of $100 per day. Did you also account for rehearsal time space? Transportation and meals for rehearsals? The cost of rehearsal, without location fees, cameras, lighting and sound is FAR less than production time, so allocate accordingly and work out your kinks prior to production. Most film budgets break their line items down to prep, shoot and wrap to cover pre to post production resources. 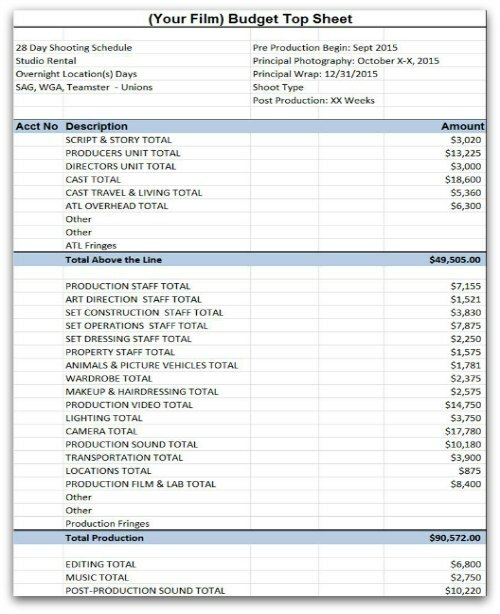 Your budget shows $100K in total Production Costs over a 30 day Shooting Schedule. That comes to $3,333 per day, $416 per hour (assuming 8 hour days) or $7 per minute. That means, if someone or something takes just 5 minutes longer to do than originally estimated, you've just wasted $35. Obviously, one 5 minute delay should not make or break your production, but keep adding these up and you can easily see how the cost of being stuck in traffic, people showing up late or other filming delays can derail an entire production shoot. Maybe a scene requires one more take more than predicted...but now you've lost daylight...and the whole team has to recreate the scene tomorrow. Keeping your burn rate on the front of everyone's minds helps everyone maintain accountability for the production. Outside of the film industry, people often burn rates to show the company's cost when an executive is late for a meeting and 12 other executives are sitting around waiting (Executive combined salaries divided by an estimated 2080 paid hours in a work year). Keep in mind, Film Negative Costs, a term invented before the era of digital film making, are defined as the costs to, quite literally, create a shipment-ready negative of your film. The film budget template takes you only to this level of funds, and so it is up to the filmmaker to use another form, such as the Film Financial Projections Template, to determine marketing, publicity, film festival and other post production costs. A Business Plan, used for the purpose of raising funds from film investors, will encompass the costs of producing AND distributing/marketing/selling your film. This budget template is not for an Excel novice, nor does it require any advanced Excel knowledge. Some basic skills we recommended to successfully use the template include: understanding numbers vs. formulas, hiding rows and columns, copy and “paste special” including formulas and/or values, and knowing how to trace or follow linked formulas.